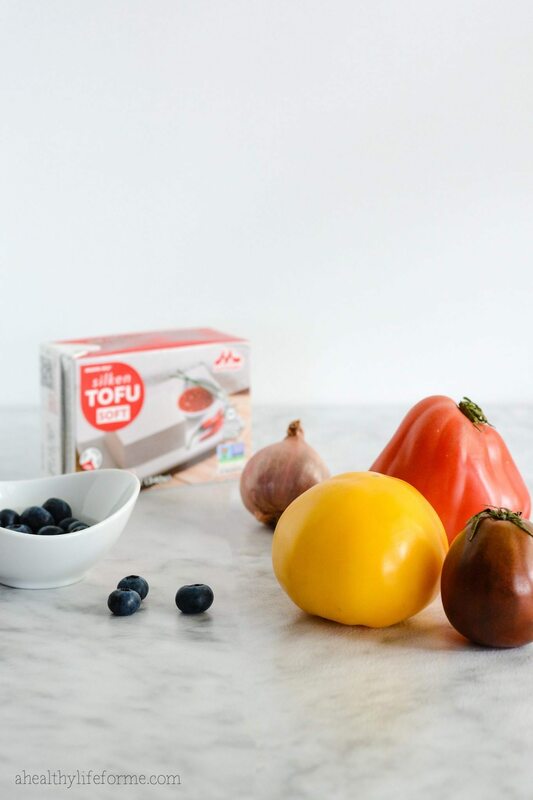 Tomato Blueberry Tofu Salad is loaded with tons of flavor and freshness, while the tofu gives you that protein you desire. This dish is gluten-free, healthy, vegan and vegetarian. Last week we went on a trip to Miami to celebrate our anniversary. We always like to try out new restaurants while we are there, and one restaurant that came highly recommended was Pubelly. We were excited to give it a try, a gastropub with Asian-fusion small plates, meant for sharing. We ordered based on the waiter’s recommendations and everything we tried was delicious and distinct. 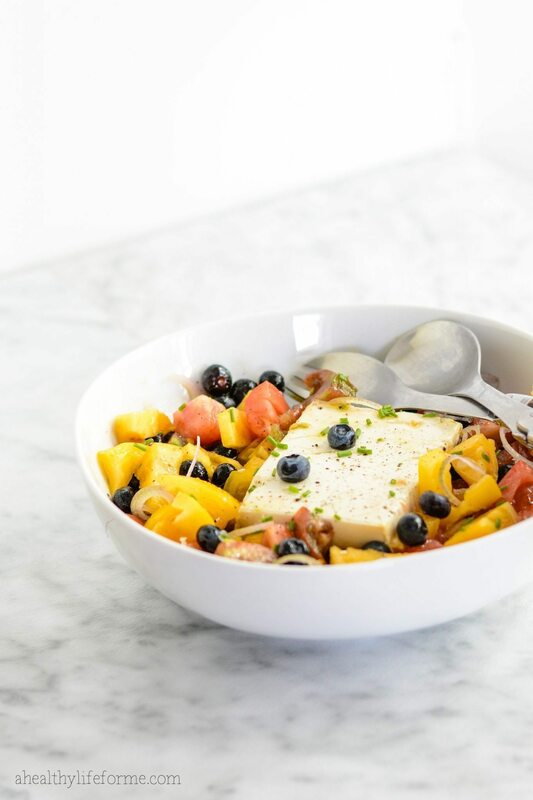 Our first dish was an Heirloom Tomato Salad with Tofu, and we were both amazed how such a simple dish could be loaded with so much fresh flavor. Not to mention the presentation was gorgeous. As you can see when I got home I worked on recreating that salad and boy were this an easy dish to pull together took me less than 10 minutes, with little clean up. 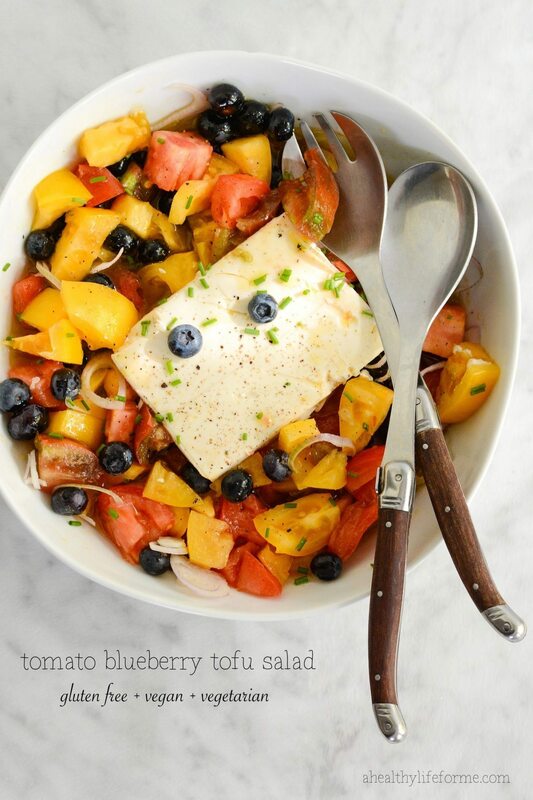 This Tomato Blueberry Tofu Salad is loaded with heirloom tomatoes, organic blueberries, shallots and Non-GMO soy Mori-Nu Tofu. A Healthy dish that is packed with so much healthy good for your flavor, and protein. I haven’t used tofu a lot in the past, mostly because I wasn’t sure how to use it. 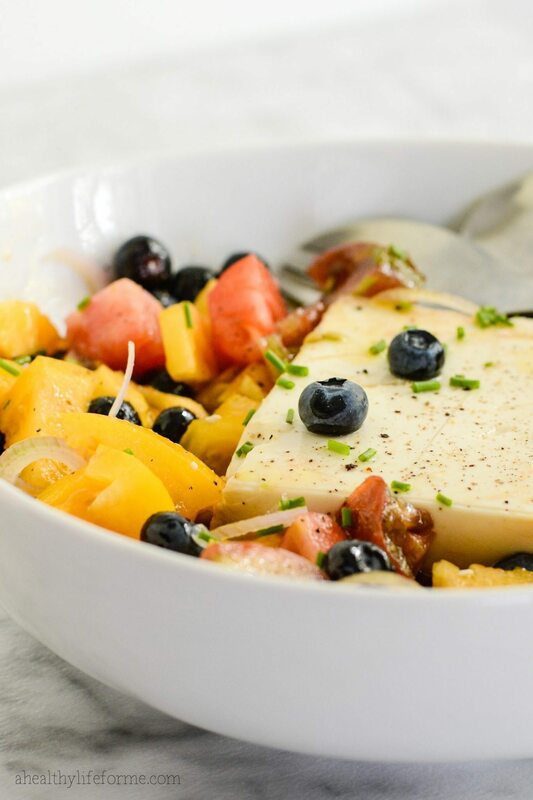 In this dish, you place the tofu whole in the center of the serving bowl and spoon the tomato, blueberry mix around and a bit on top of the tofu for presentation. When it is time to serve you just grab a spoon full of tofu, tomatoes and pile it on your plate. The dressing adds the marinate to the tomato mix and tofu and since the Mori-Nu tofu is so smooth and delicate the texture is perfect. I used the Mori-Nu Tofu because it needs no refrigeration, so I could store it in the pantry to pull out as needed. I also wanted to make sure that the tofu that I used was verified Non-GMO by the Non-GMO Project, which is very important to me. It is also Kosher and Gluten free. Mori-Nu Tofu also offers an organic variety. If you would like to learn more about Mori-Nu Tofu stop over at the Mori-Nu Facebook page and give them a like, so you can be entred to win. Yep WIN, don’t miss the great chance to enter and win the following from Mori-Nu! There will be 25 prizes total and winners can enter by liking the Mori-Nu Facebook fan page or following Mori-Nu on Twitter or Pinterest. See below. Official Rules can be found (here). In a small mixing bowl, whisk together olive oil, vinegar, sake and sea salt. Pour dressing over tomato mixture. 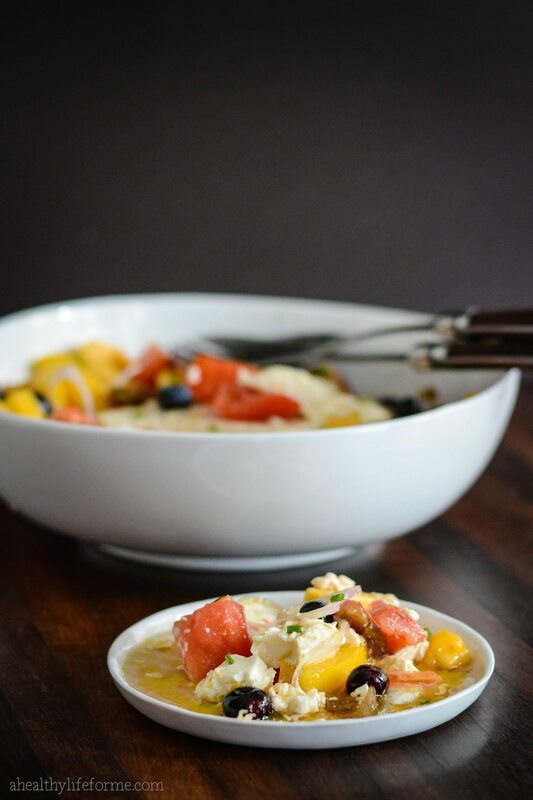 In a large bowl toss together tomatoes, shallots and blueberries. Pour dressing over and stir to combine. In a large serving bowl place tofu in center and then pour tomato, blueberry mixture over and around tofu. What?! This is awesome. We use a lot of tofu in our kitchen, but I’ve never thought to pair it with sweet ingredients for protein-packed salad! This is brilliant and totally unique.